Malcolm Turnbull was the key decision maker when he gave a dodgy $10 million grant to his friends just before the 2007 election while he was still the Environment Minister in the Howard government. This puts Turnbull in the same club as the corrupt Eddie Obeid, Arthur Sinodinos and others. Obeid is looking at jail time after being charged by the police and Sinodinos had to resign yet some people want to make Turnbull the Prime Minister. While Turnbull might be able to palm off some things in his past he will never be able to justify the $10 million for his mates and that is why the Labor Party will go after him hard on the issue. Mr Turnbull has refused to answer numerous questions in relation to the $10 million grant he gave in 2007 to his friend Matt Handbury when he was the Environment Minister. Matt Handbury was one of the donors to Mr Turnbull’s Wentworth Forum. 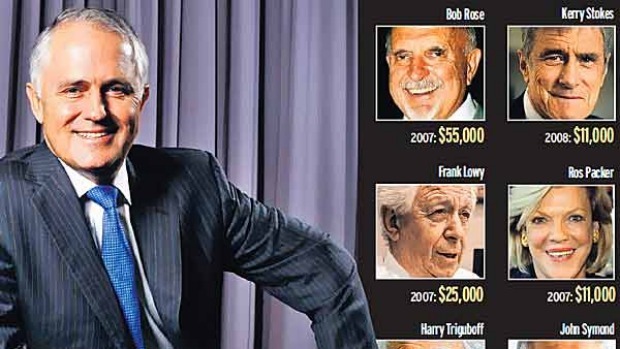 Even the well-known tax cheat Kerry Stokes donated money. And Kerry always wants a return on his investment. I wonder what Malcolm gave him? Before the 2007 election and two weeks after the election was called Malcolm Turnbull announced that the government would spend $11 million ($10 million plus GST) funding a trial of rainfall technology. The company in question was Australian Rain Corporation which was then part owned by Matt Handbury. The mainstream media have not been reporting Mr Turnbull’s dirty laundry in recent times but you can be guaranteed that the Labor Party will raise it if Turnbull wins. Even worse for the liberal party is that social media will be raising Turnbull’s dirty laundry day in day out until the next federal election and social media is where a lot of the damage will be done with voters. One would have thought with corruption inquiries around the country and the anti-corruption mindset of many voters anyone with even a hint of corruption about them would be ruled out as a candidate for any political party let alone the leader’s job. The Band just keeps Playing On as the Titanic Sinks, no wonder so many Good People are just Losing Faith in the Whole Rotten System.. !! Politicians are robbing us blind. None of this mischief comes as a very great surprise…just that there is no limit to its persistence and complexity. My God, I’m praying for Tony Abbott just now. What about the Independent Commission Against Corruption? No concerns? Are we sure ICAC knows the true meaning of “corruption”? I have my doubts considering the result of several corruption cases which have been nothing more than a slap on the wrist…. that’s about as tough as it gets. Shame..Shame..Shame!!!!!!! So, if as you say, Labor has dirt on Turnbull and will stir the dirty laundry basket belonging to Turnbull should he become leader and PM why have they not found more in Abbott’s basket than a dent in a wall. (They have had 5 plus years to swirl around in his laundry basket) Abbott is obviously a clean skin or Labor and it sycophants who pass themselves off as MSM professionals have found nothing. The weak people who pose as Liberal MP’s should put their thinking caps on pretty quick smart. They haven’t, which is why they are using this method of getting rid of him. Turnbull is textbook NWO, as can be seen by the list of contributors to his fundraising machine. They want one of their own there, and Abbott didn’t do what he was told by putting Australia ahead of the Globalist Elite. Not that it will bother the good readers of this column,but if they oust Tony Abbott in favour of Turnbull I will resign from the Liberal party along with many others I know.Ditching or trying to ditch first term prime ministers is not the old Liberal party’s DNA. Although a successful entrepreneur and also a good politician the means of his achievements are very shaky almost as shaky as Shorten’s. I am sick of parlour games and musical chairs in parliament is not on and with the ABC conducting the music and the drongoes in the electorate that appear to want more chaos by voting Labor, I have come to the conclusion that either masochism or altzheimers has taken over the Australian electorate. Please may I leave the planet as I am not impressed. Allan from Myalup WA..(the traitor state)..
I’ll be doing the same, Allan Usherwood! Seems the position of PM is worth very little to the majority of the population, and in the current political climate, it’s more likely that the “handsome”, popular or easy-going person who’ll give the dreamers all they want, will always win out over someone who’ll return us to a common sense and viable Government! Tony Abbott has not been given a fair go! Everything he’s tried to do to repair the Labor Party’s mess has been blocked by the very people who made that mess, along with support from the questionable element in the current Senate! We’ve become a very selfish/self-serving people! A NEW political party kicks off in October 2015, Australian Liberty Alliance – l have dumped the Libs after all this garbage, & there is no decent choice in any of the other parties, so l will vote for a change for the better, can’t get any worse !! Turnbull wants to be Treasurer? Mr Abbott made so many categorical promises that he dug a huge hole for himself. Not only that but he then made another and another set of promises which have also been broken. This all seems to lack any sort of common sense and a failure to learn from events. As for Malcolm Turnbull, he is sitting on the wrong side of the chamber and should not be entertained as a candidate for PM. In fact he should not be entertained as a member of the Liberal Party. I haven’t forgotten his support of the Tasmanian pulp mill and an ETS. Australia needs a fresh look at our political structure as this confrontational form of politics is destroying us.We have an opposition devoid of policies with a history of fiscal failure blocking everything on principal and a government lead by someone that seemingly thinks it is reasonable to make cast iron commitments fail to implement them or reverse them and then replace them with another set of commitments that will follow the same path. I have lost faith in our political system and Mr Abbott. Saxon, Tony Abbott can hardly be blamed for the broken promises with the stone walls thrown up by his detractors, so isn’t it better that he make the best of it by changing his approach when he can’t have the final say on keeping those promises? The “fresh look at our political structure” should include more power in leadership decision-making i.e. promises made by any PM before an election must be adhered to, regardless of Senate approval, as agreed to by those who elect him/her to the position, by law! If changes need to be made to the Constitution, bring it on. No second chance for any PM who fails to do so! I believe, that when Mr Abbott made those statements about the ABC etc. he had no idea that the deficit was $ 48 Billion instead of the $18 Billion, they had been advised of. I will also not support a change of Prime minister. I think the spill should take place and it should be by a show of hands, so that we can see, who votes for what. I just heard that Sinodinos will back the spill, this after the Prime Minister stood by him, when her had to appear before the ICAC. What a creep!. Just the thought of Turnbull becoming PM makes me ill.
Turnbull is a slimy piece of work, not to be trusted, Sinodinas falls into the same category. l also will not support Tony Abbott getting the flick, and would want to know who voted against him. If he survives, he has got to get rid of all the Judas goats. The spill is on Monday now, l see on the ABC, & it will be a secret ballot, so the traitors will never be identified, gutless & undemocratic! Will he or won’t he? Can he or can he not? Yes or No or Maybe? Geeeez, enough already. Simply put… some are born to be leaders and some are not. The whole spill motion was a cleverly orchestrated plan set in motion with the assistance of the MSM and his friends the ABC with the conductor being the one who had the most to gain from Abbott losing the spill motion – Turnbull. I just don’t want to think that Julie Bishop was involved as I have a high opinion of her but I have a really sickly feeling that she may have had a hand in this at the behest of Turnbull on the promise that nothing would change for her. This is far the end of this as Their ABC and the MSM will continue to push for the Communications Minister who appears to be the luvie of the left. I just hope that Abbott can get some clear air for awhile and start implementing the changes necessary for Australia and our future, long and short term. Regarding Turnbulls dodgy donation to his friend Handbury, Julia got away with her crime, so like a lot of other politicians I am sure Turnbull will also get away with it. Turnbull and Gillard are two sides of the same treasonous coin. They both represent external interests that are not the same as ours. To update: Turnbull and Shorten are two sides of the same treasonous coin. They both represent external interests that are not the same as ours. Australia, NWO/ Agenda 21 here we come. Very disappointed. ALA here I come. Thanks Maryanne. I remember Lord Monckton saying this when he was in Oz a while ago. He’s also on youtube saying the same thing. $2 billion dollars. The price Turnbull paid of our money to get the Nationals to support him on the floor. Personally I would rather have seen the Nationals refuse to support him and let the people decide at an election if they wanted Turnbull or not. I reckon if they had and stood a candidate in every seat there would be a good chance they would be the majority partner in the coalition afterwards, if not the outright majority party. The only winner is the media. The loser is the Australian public. The hysterical comments are just the usual false flag noise that the established media constructs, directs and implements….it’s called “the long con” . Out goes Abbott with all his foolhardy actions like bombing Syria and in comes Turnbull the billionaire politician with north American ties. We’ll done Murdoch, well done CIA. How I wish Whitlam could have told us more before he died!! At least Fraser says so in his book, but the Media suffocates it all…now they attack Turnbull…..Really trying to keep the Brady bunch mentality alive in household Australia…..remember, no responsible media = no democracy; ever!